Since setting off for California two years ago, I have fallen in love with spaces. Spaces, to me, are gemstones on our journeys. We can go home to a sanctuary, or not, yet behind every door is an unknown potential. It is empowering to be a part of building and creating a space, decorating a room, setting intentions for the way people can experience it. It has been wonderful to be in Baltimore for a fresh start, to new art galleries and changed neighborhoods. I look forward to trips on the calendar for personal recharging and professional growth. I look forward to playing in new spaces, to traveling and learning new trails, and to the people I will meet along the way. I love to walk and find quiet urban neighborhoods. I love sunset when the neon lights come on and the late risers leave their homes to start their day. I love the woods and the sounds of water rolling into the beach. I miss California, and I am lucky to continue my work, music in my backpack, sharing stories with new people who love sacred spaces as much as I do. There are some things brewing in my singer/songwriter pot, and an upcoming show for my fans who are looking to get out into nature. For the second time in my career, I am running off into the woods to play at and intimate event for womyn in the woods. May 22, 2016 will morph a music festival into an intimate house concert. 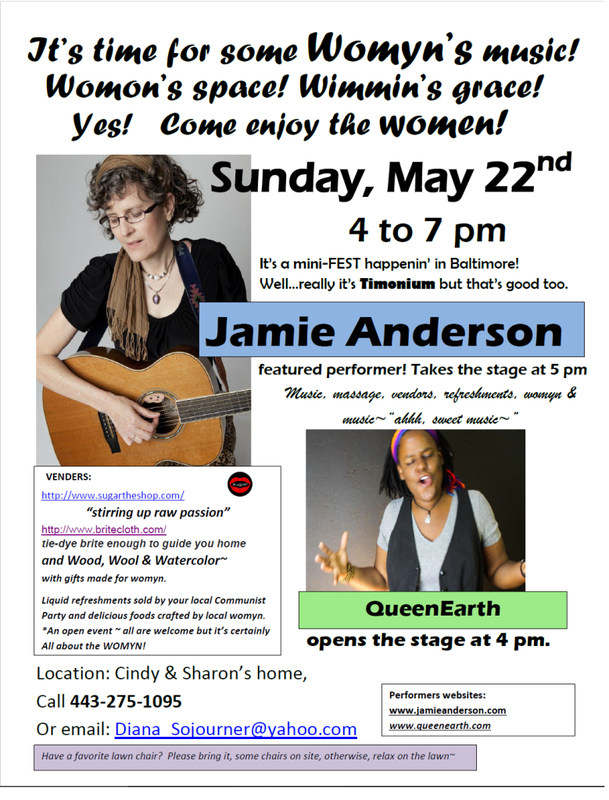 I am honored to open for Jamie Anderson. “Jamie did her first national tour in 1987 because she needed to earn gas money to get to a music festival. She’ s been collecting tiny motel soaps ever since.” Her bio was inspiring, and I know I’ll meet some awesome folks and make some new friends with the crowd she will bring for this mini Michigan Womyn’s Festival. 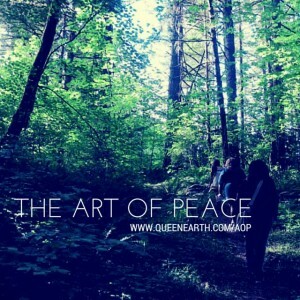 This entry was posted in QueenEarth and tagged art of peace, Baltimore, jamie anderson, michigan womyns fest, minifest, QueenEarth, womyn, womyn's space. Bookmark the permalink.